KOOLTRONIC Horizontal Top-Mounted Air Conditioners provide a full range of cooling capacities where space or other limitations prevent panel or internal rack mounting. This versatile line of Top-Mounted Air Conditioners offers five series of models, from 2,500 to 12,000 BTU/H, in five sizes. They feature specially designed, heavy-duty centrifugal blowers or fans (Horizontal Super-Mini Series) to force the cooling air throughout the enclosure. 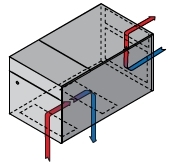 The low profile Horizontal Super-Mini or Compact Series are recommended for lower to moderate-demand cooling applications in smaller enclosures. For more demanding applications, or for larger or denser enclosures, the Compact Plus Series is preferred. This series provides 1,500 to 5,000 BTU/H performance for medium-size enclosures and a choice of two heat-laden ambient air discharges. The largest model in the Horizontal Top-Mounted Series is available in a capacity range covering applications requiring cooling to 12,000 BTU/H. Outdoor or corrosive environments require weather protection and/or special internal and external protective features. 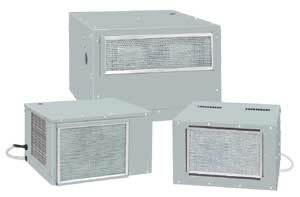 All Advantage Series and Compact Series models are UL/CUL Listed. All Super-Mini, Compact Plus and Full Size Series models are UL Recognized. All Recognized models are available as Listed at added cost. CFC-free R134a Refrigerant is used in all Advantage, Top Mount, Horizontal Super-Mini and Compact Series Air Conditioners. R410a refrigerant is used in all Full Size Top Mount Series Air Conditioners.